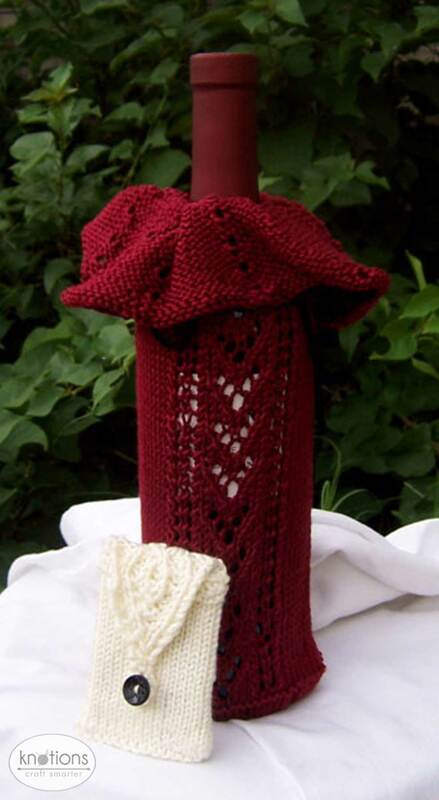 Dress up any wine bottle to create the perfect one-size-fits all gift this holiday season. Use up any of those lovely lone skeins in your stash to make a quick gift. The sample shown is knit in Jaeger Silk, which has been discontinued, but any dk weight yarn should give you great results. A tiny little holder dresses up the easiest gift of all – a gift card. 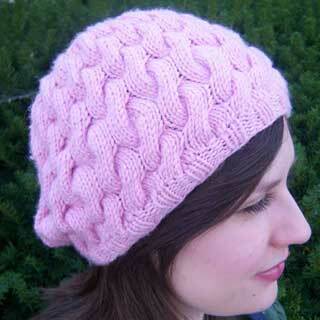 Although the cables make it look complex, this is an easy, quick knit. Half an ounce of any DK weight wool will do. One size. Cozy has a 10” circumference and is 10” tall. To fit a smaller or larger bottle, adjust your gauge slightly. Jaeger Silk (100% silk; 203 yds [185 m] / 50 g): 1 skein, or any yarn to give comparable gauge. Safety pin; 5 stitch markers; tapestry needle. One size: 2.75” x 3.5” closed. Sublime Yarns Cashmere Merino Silk DK (75% extrafine merino, 20% silk, 5% cashmere; 127 yds [116 m] / 50 g): Color Waterlily, 1 ball. Size G crochet hook; 1/2″ button or bead for closure; tapestry needle. The pattern is worked from the bottom up, in the round. You begin with Judy’s Magic Cast on, directions for which can be found here. The first row is the hardest; don’t let it discourage you! After the first round, spread the stitches around three or four needles. Use the safety pin to mark the beginning of the round. Hold two double pointed needles parallel and use Judy’s Magic Cast on to cast on 10 sts, 5 on each needle. Cont in patt, working one more stitch between each set of YO’s every other rnd until you have 70 sts. Work one more plain knit rnd. Next rnd: Purl. Note: this creates an edge to transition from the base to the side. Transfer sts among four needles so that there are 17 sts on needle 1, 18 sts on needle 2, 17 sts on needle 3 and 18 sts on needle 4. Note: The next set of instructions is given as both charted and written instructions. Choose the instructions you prefer – do not follow both sets. 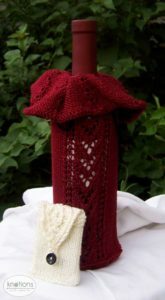 Rnd 1: *Work rnd 1 of Wine Cozy Chart, k18, rep from * once more. Rnd 2: *Work next rnd of Wine Cozy Chart, k18, rep from * once more. Rep rnd 2 for a total of 10 reps of Wine Cozy Chart, or until piece reaches mid-way up the taper to the neck of the bottle. An alternative to the charted instructions above. Rnd 1: *K2tog, yo, k1, yo, ssk, k3, yo, ssk, k2, k2tog, yo, k1, yo, ssk, k18, rep from * once more. Repeat these six rnds 10 times, or until piece reaches mid-way up the taper to the neck of the bottle. Set up rnd: K2, pm, *k14, pm, rep from * until 12 sts rem, knit to end of rnd. Rep these two rnds 10 times. Bind off loosely, weave in ends. Thread yarn through bottom row of yarn-overs at neck, tie cozy with contrasting yarn. Silk and other smooth yarns do not serve well as a tie; use wool, cotton, or ribbon. The cozy is knit from the bottom up, starting with Judy’s Magic Cast On and using the magic loop technique. You can also use double pointed needles or two circular needles if you prefer. Hold the two ends of the circular needle and use Judy’s Magic Cast on to CO 15 sts on each needle; 30 sts total. Note: Step-by-step instructions for how to do the centered double increase in Rnds 13 and 19 can be found here. Note: Begin working back and forth in rows. BO all stitches, do not cut yarn. Leave a 1/2” loop rather than pulling tight. Using crochet hook, work slip stitch crochet around loop to stabilize. 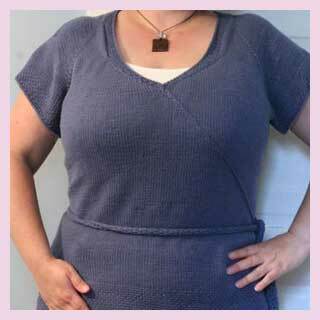 Fold over flap and sew button on front so it matches with crocheted loop. A former math teacher, Elizabeth carries a graphing calculator in her knitting bag, and isn’t afraid to use it. She loves finding new and better ways to knit classic, flattering garments. She lives in Tucson, Arizona with her husband and son. Pattern and images © 2008 Elizabeth Warner.